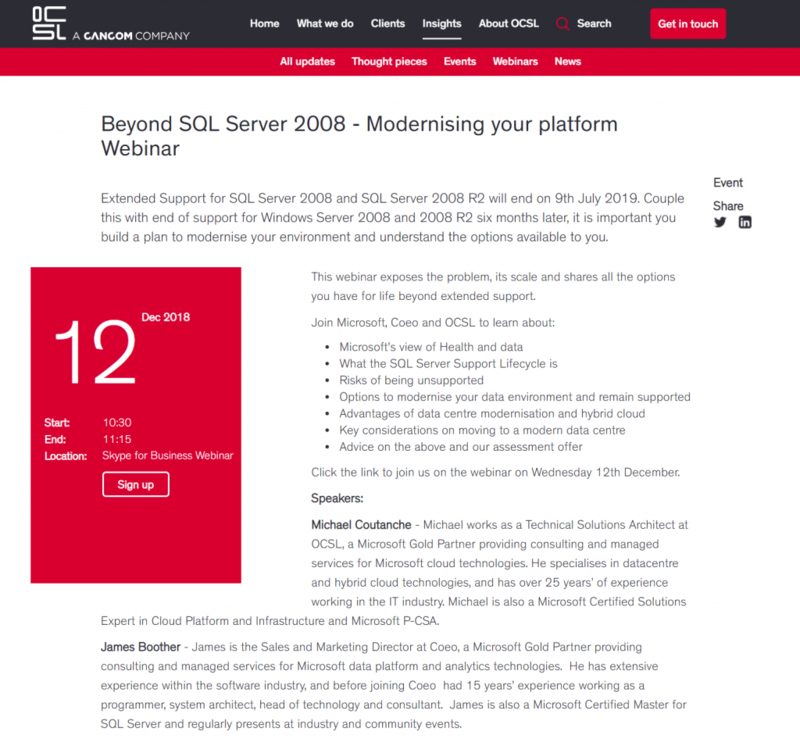 The webinar will take you through the ins and outs of unsupported platforms and how to modernise following the end of Server 2008 and SQL Server 2008 support. 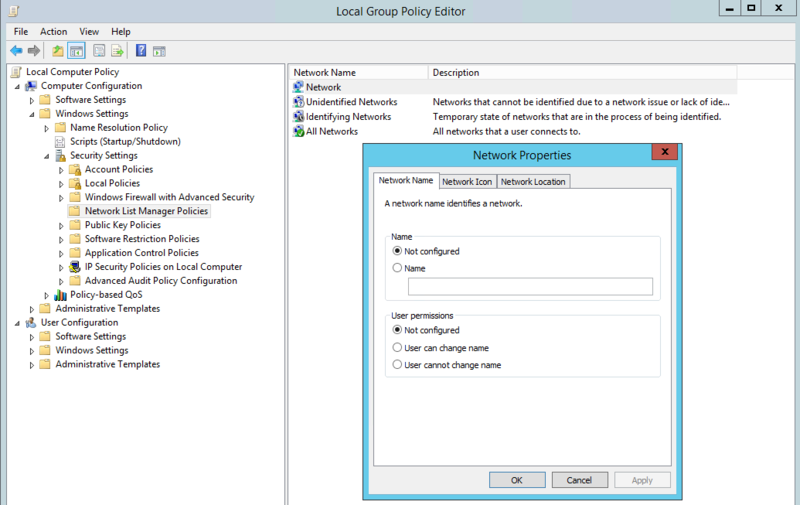 It’s sometimes necessary to manually change the network location configuration of a Windows 2012 R2 Servers network connection. There are two common approaches to this, either by Local Group Policy or PowerShell. In this post I will be stepping through how to implement either method. 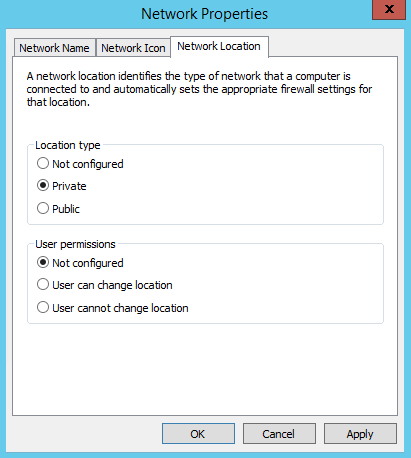 Windows classifies networks connections into one of three profiles, each profile configures the server with different firewall settings. Private: Used for computers on a private or home network. This allows you to see computers and devices, while making your computer discoverable. Public: Used for computers on a pubic network such as a coffee shop or internet café. Designed to keep your computer from being visible to other computers around you and to help protect your computer from any malicious software from the Internet. Domain: Used for computers that belong to enterprise network. By default new network connections are configured with the public profile, however, if ADDS (Active Directory Domain Services) are found on the network, the profile automatically changes to domain. 5. Finally checking back in the Network and Sharing Center, the network profile should now display the options chosen in the previous steps. As with most things on Server 2012 it is possible to use PowerShell to change the network category. We first need to list the network connections and make note of the InterfaceIndex associated with the network connection we are looking to reconfigure. 3. To confirm changes have been made, rerun the Get-NetConnectionProfile CmdLet and review the NetworkCategory reflects the change. As mentioned in my previous post here Microsoft have added the ability to backup additional workloads such as SQL, Exchange, Hyper-V and SharePoint to the cloud. Essentially this version of Microsoft Azure Backup is actually nothing more than a rebranded version of System Center Data Protection Manager with the backup to tape option replaced with the cloud and the ability to integrate with System Center removed. However, where no separate license is required, I believe this now opens the door to many new enterprises and I’m sure it will become a very favourable cloud backup solution. 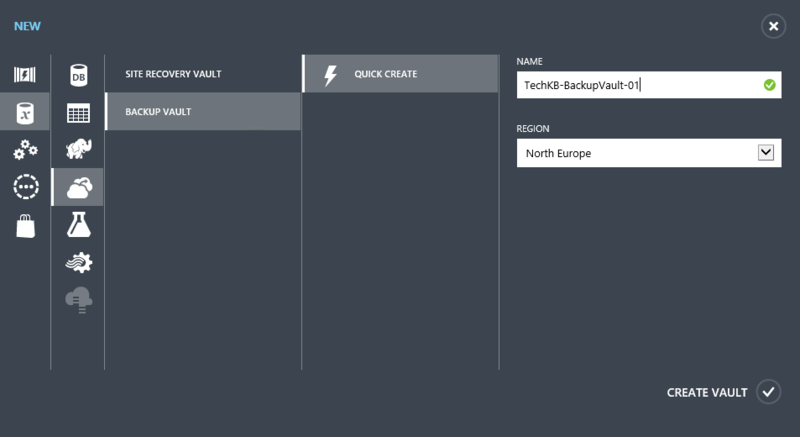 In this post I will step through the process of configuring a Microsoft Azure Backup Vault, installing Microsoft Azure Backup and registering it with the previously created vault. Windows Server 2008 R2 SP1, 2012 and 2012 R2. 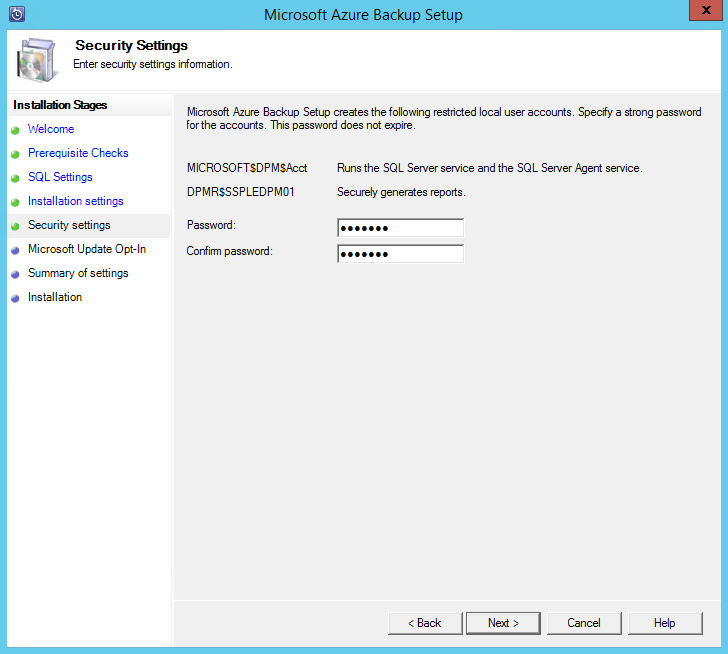 NOTE: The server must NOT have SCDPM or the SCDPM agent installed, nor should the Microsoft Azure Backup agent be installed and registered with an Azure Backup Vault. 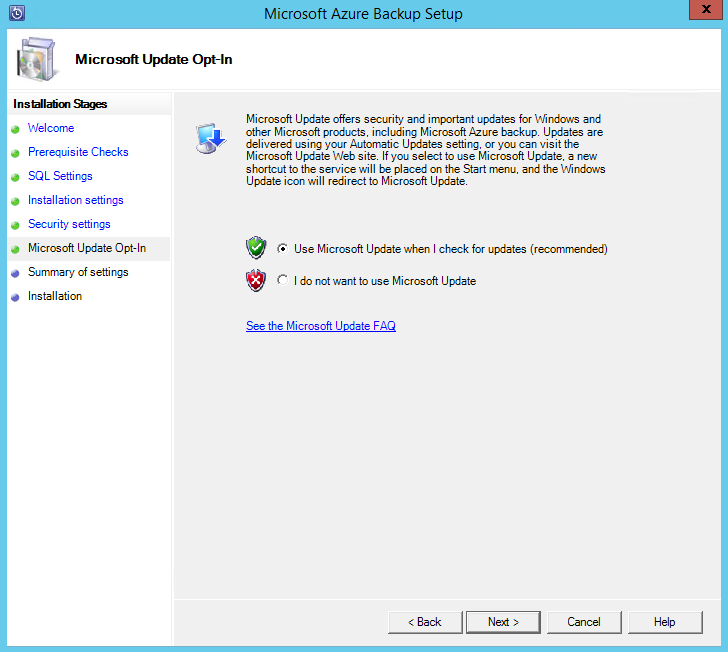 Microsoft Azure Backup server should have Windows Management Framework 4.0 installed. 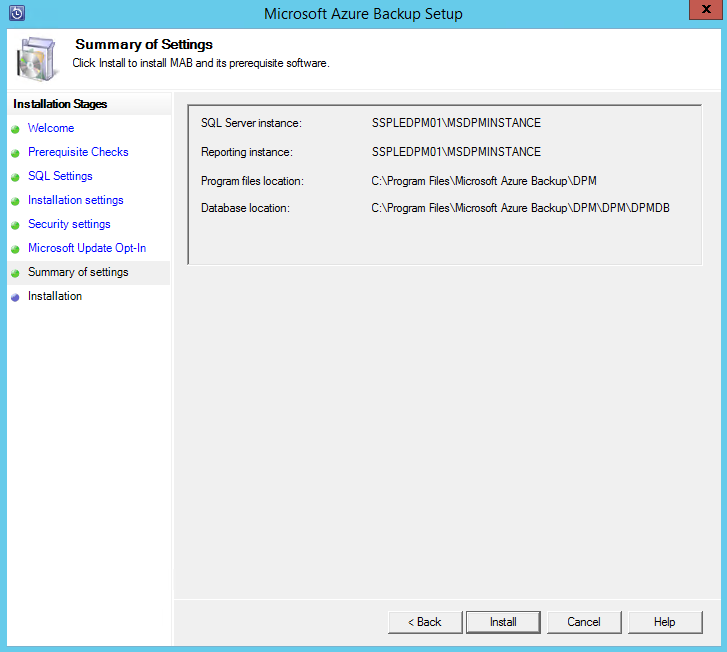 Once a base server has been prepared, the next step is to preconfigure the Azure Backup Vault. 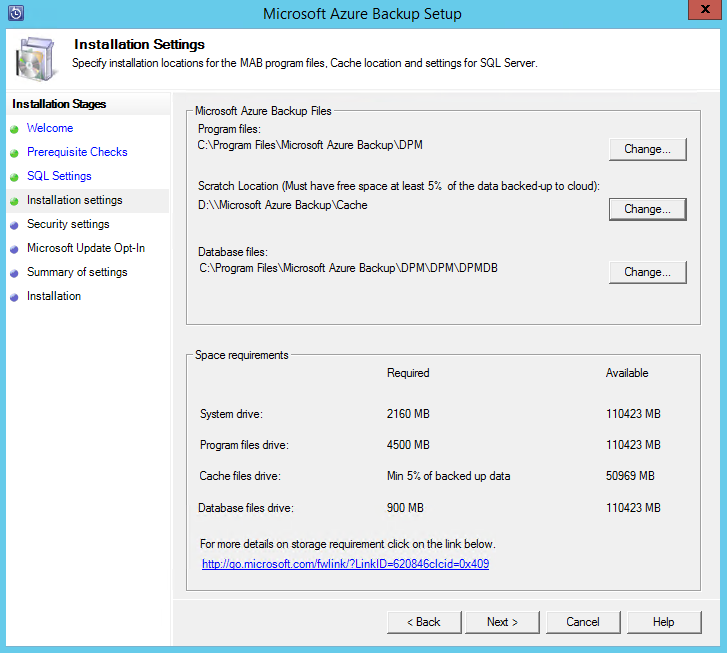 The Microsoft Azure Backup Serer will be registered with the vault later. 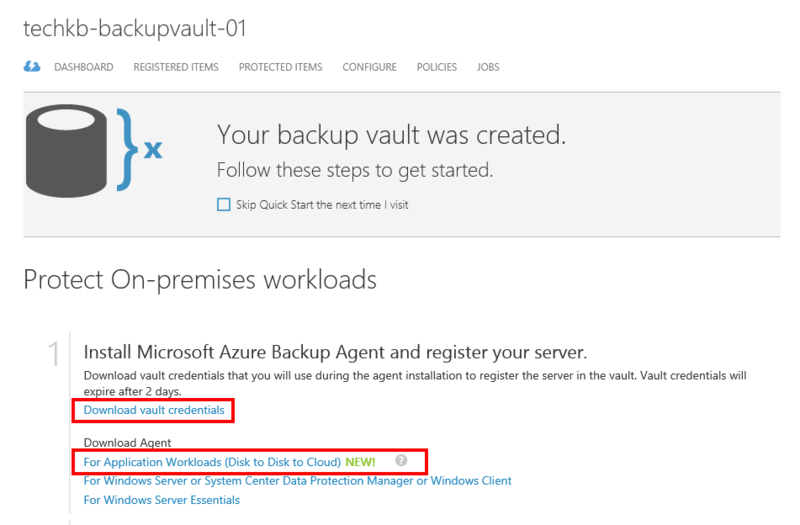 To create an Azure Backup Vault, firstly browse to https://manage.windowsazure.com and sign in to the Azure Portal with your credentials. Scroll down the left hand menu and click on the Recovery Services tab. In the main window click on CREATE A NEW VAULT. 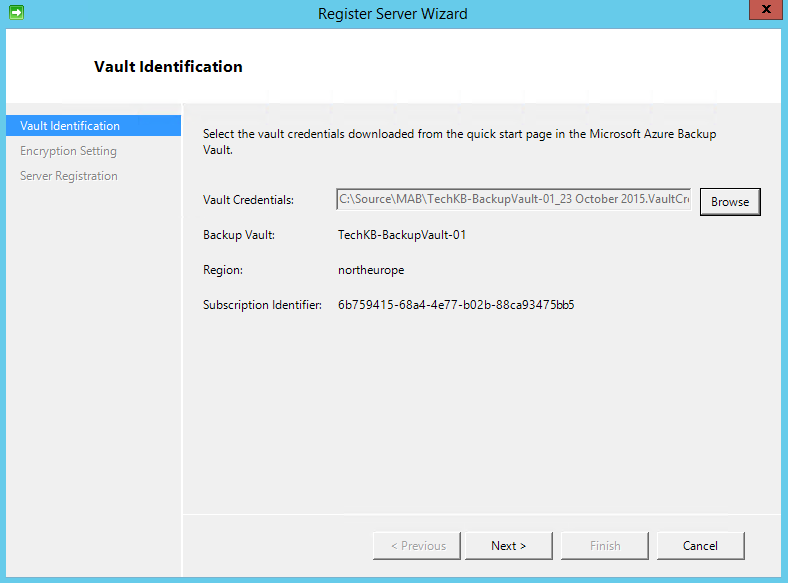 Select Backup Vault > Quick Create before giving the backup vault a Name and Region and clicking the check to create the Backup Vault. The Region will be the location in which the data is stored, choosing the correct location can help reduce network latency when backup up data to Azure. 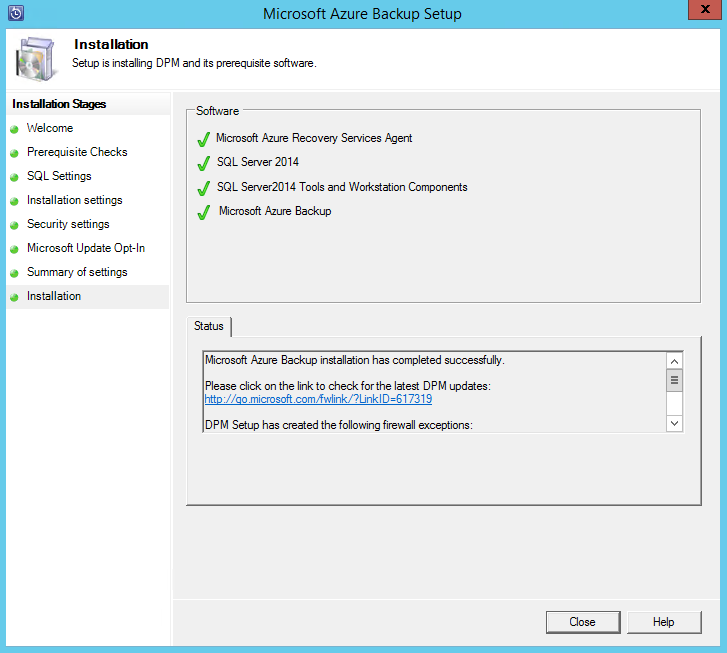 Once the Backup Vault has successfully been created it will appear in the list of recovery services resources as Active. Once items have been archived to the Backup Vault its not possible to change the replication type, so its at this point we need to decided how this should be configured. Locally Redundant Storage (LRS) maintains three copies of your data. The data is replicated three times within a single facility in a single region. This would protect your data from normal hardware failures, but not form failure of an entire Azure facility. By default a Backup Vault is configured with Geo-Redundant Storage, to change this click on CONFIGURE before changing the replication option and clicking SAVE to complete the change. 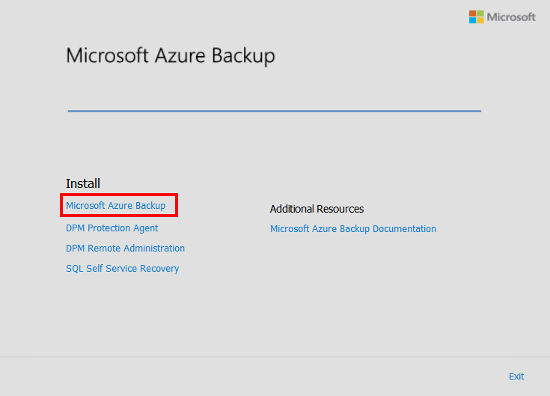 Before we can begin the install of Microsoft Azure Backup server we need to first download the installation software for Azure Backup and also the Backup Vault credentials which are needed for registering the server with the Backup Vault. Both downloads can be found on the Quick Start tab of the Backup Vault. Microsoft Azure Backup comes split up into six separate files, five .bin files and single .exe. Download them all to the same location and then run MicrosoftAzureBackupInstaller.exe, this will begin the setup wizard. On the first screen click Next to continue. On the next screen choose a location for setup to extract its files or leave the default. When happy with the location, click Next. Click on Extract to begin extracting the install files. By default, Execute setup.exe is checked, leave this checked and click Finish if you wish to continue with the installation. Otherwise, uncheck the option and click Finish. 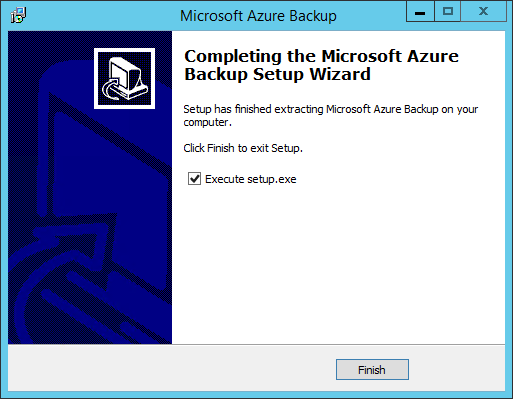 On the Microsoft Azure Backup splash screen select to install Microsoft Azure Backup. On the next page click on the Check button to confirm the server meets software and hardware requirements. Resolve any issues that are raised before continuing by clicking the Next button. 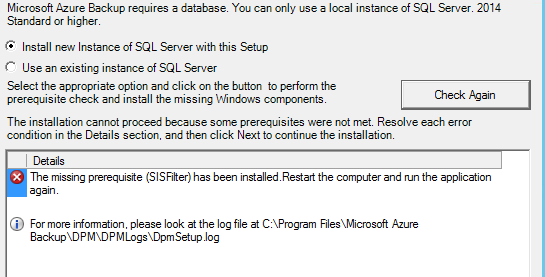 Choose whether to use a new or existing instance of SQL then click Check and Install to begin prerequisite checks and install any missing Windows components. As long as all prerequisites mentioned at the beginning of the post are installed, the only warning message that should be displayed is to warn the SISFilter has been installed and the server requires a reboot. Reboot the server and then restart the installer. Once the server has been rebooted, click Check Again and once the computer meets all software and hardware requirements, click Next. The next step is to choose the file locations for the program files, database files and scratch folder, then click Next. NOTE: As mentioned in the prerequisites, the scratch location must have free space of at least 5% of the data backed up to the cloud. Enter a strong password for the restricted local user accounts the wizard creates, then click Next. Choose whether or not to use Microsoft Update, then click Next. Review configuration and click Install to begin installation. 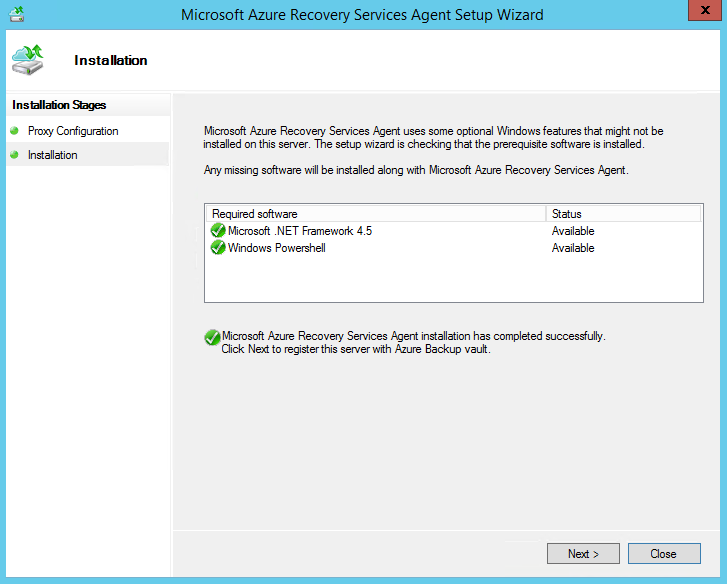 The next stage of the installation installs the Microsoft Azure Recovery Service Agent. 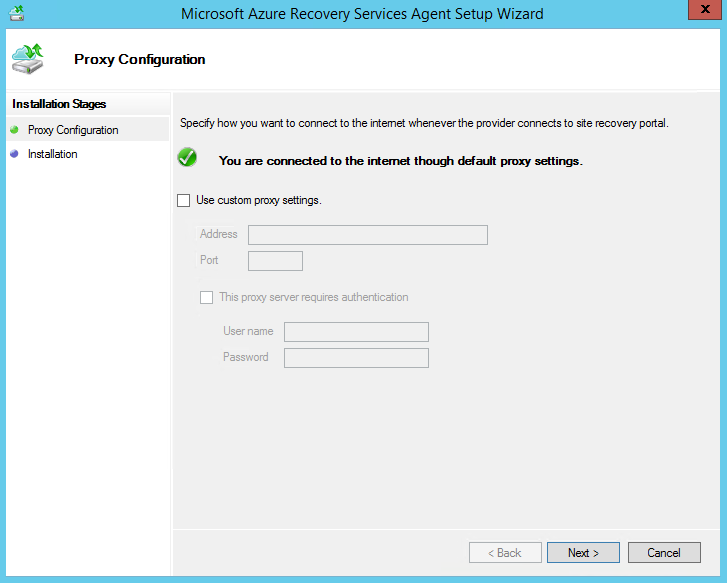 If the server connects to the internet by a proxy, this is where the proxy settings need to be added. 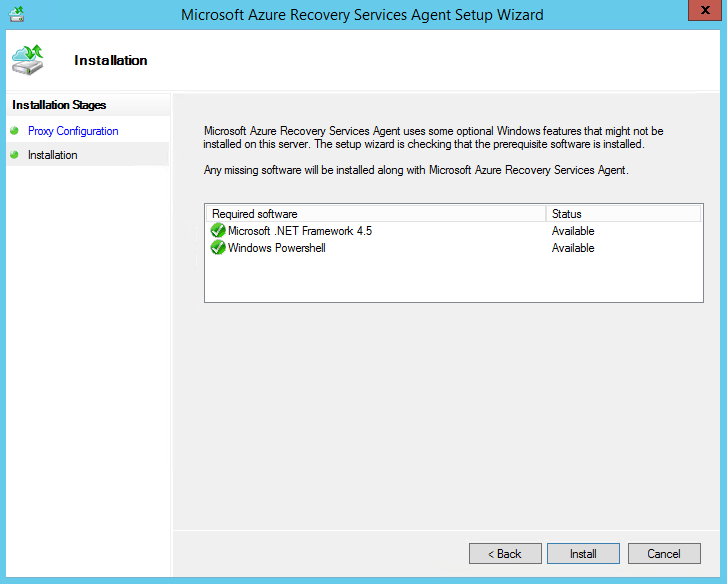 By clicking Install, setup checks for all prerequisites, installs any that are missing and completes the installation of the Microsoft Azure Recovery Services Agent. 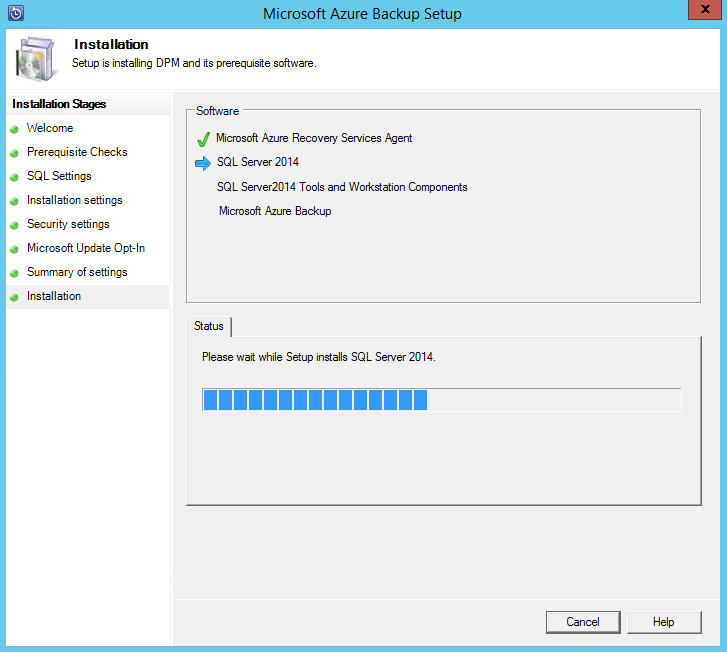 After the Microsoft Azure Recovery Services Agent has been installed, the next step is to register this server with the Microsoft Azure Backup Vault that was configured at the beginning of this process. 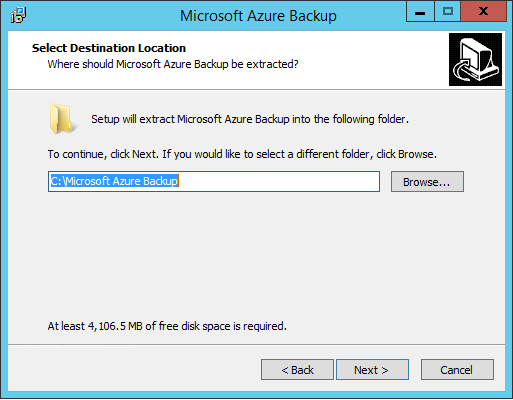 To do this browse to the credentials file downloaded from the Backup Vault, then click Next. Enter a passphrase or click the Generate Passphrase button to automatically generate a passphrase. The passphrase requires the minimum of 16 characters. 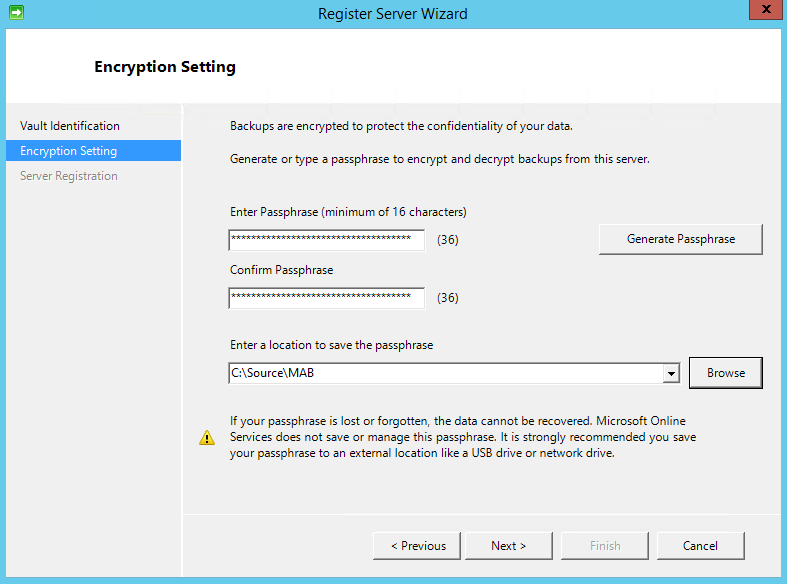 The passphrase should also be saved somewhere safe, if lost it will not be possible to recover data from the cloud or connect other Microsoft Backup Servers to the online replicas. Once the connection has been created to the Azure Backup Vault, the installer continues with the installation of SQL Server, SQL Tools and Microsoft Azure Backup. Once installation has complete, click Close. 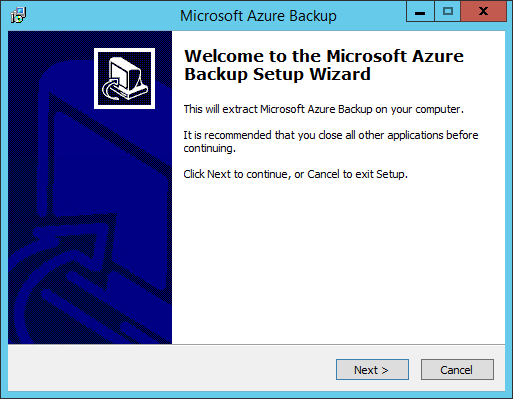 At this point in the setup process, Microsoft Azure Backup has been installed and associated with the cloud storage in the selected Microsoft Azure Backup Vault. However, before its possible to configure the first protection group and begin backing up data, local storage needs to be added. 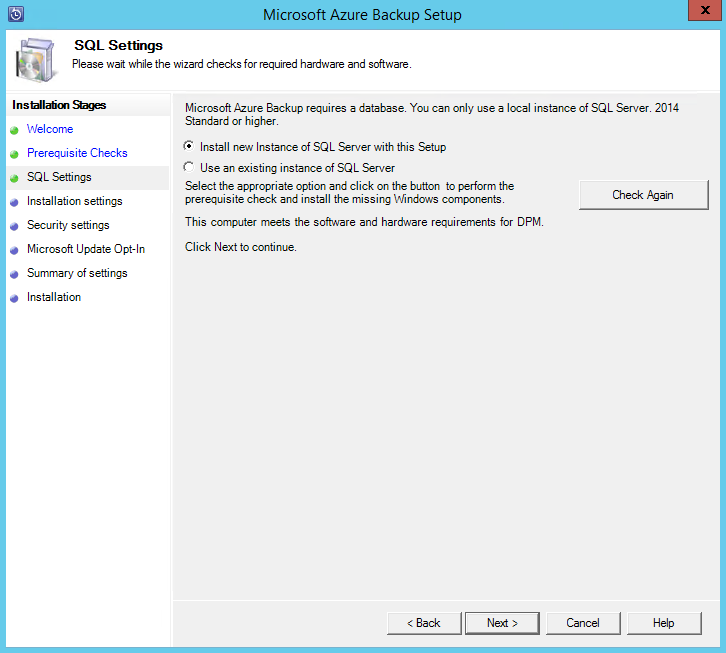 To do this, double click on the Microsoft Azure Backup icon on the server desktop to open the application. Click on Disks, then on Add. Select the disk that will be added to the storage pool, click Add then OK. 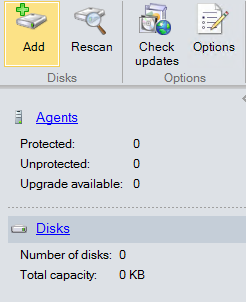 If everything has gone correctly, the disk will appear in the list of disks available to the storage pool. 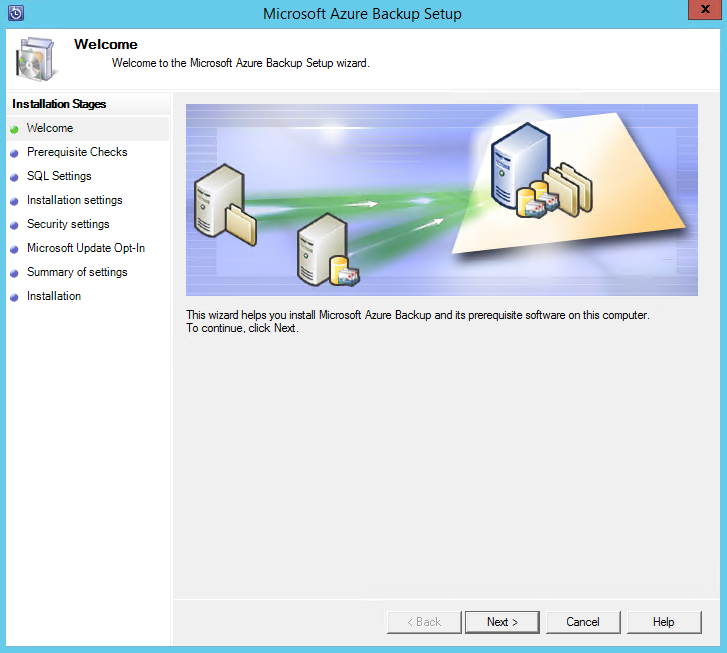 Microsoft Azure Backup is now installed and configured with local and cloud storage. It is now ready to begin configuring protection groups and start to backup data. 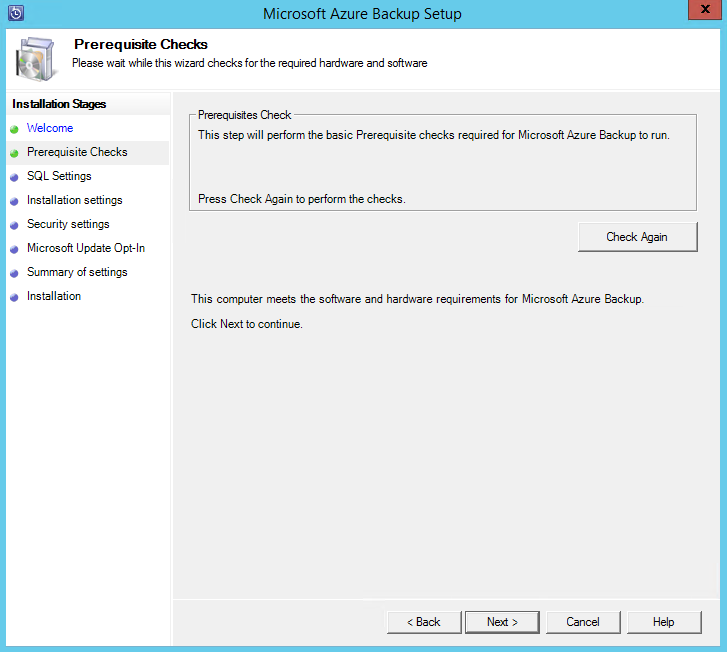 That’s it for this post, in future articles I plan to cover more Azure Backup processes so don’t forget to check back! After installing the Technical Preview of the next server OS, I was quite interested to see what new features Hyper-V came with. Obviously there are lots of new functionality in the new version and no doubt plenty more to come but here is a list of a few of the new features mentioned at TechEd. 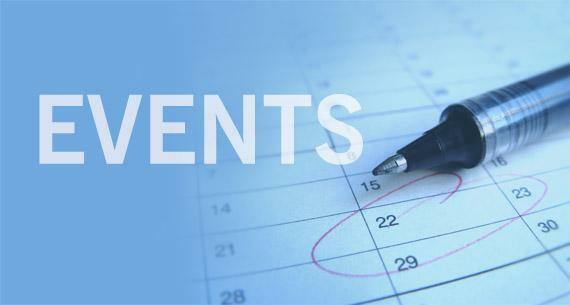 The following list has been taken from TechNet and the TechEd slides available on Channel 9 link at the bottom of the post. You can now add a node running Windows Server Technical Preview to a Hyper-V Cluster with nodes running Windows Server 2012 R2. 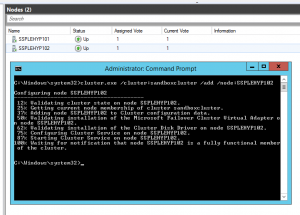 The cluster continues to function at a Windows Server 2012 R2 feature level until all of the nodes in the cluster have been upgraded and the cluster functional level has been upgraded. When you move or import a virtual machine to a server running Hyper-V on Windows Server Technical Preview from Windows Server 2012 R2, the virtual machine’s configuration file is not automatically upgraded. 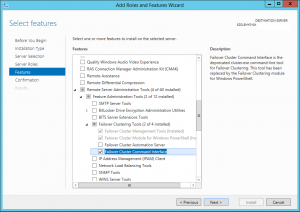 This allows the virtual machine to be moved back to a server running Windows Server 2012 R2. You will not have access to new virtual machine features until you manually update the virtual machine configuration version. Linux operating systems running on generation 2 virtual machines can now boot with the secure boot option enabled. You can now create storage QoS policies on a Scale-Out File Server and assign them to one or more virtual disks on Hyper-V virtual machines. Storage performance is automatically readjusted to meet policies as the storage load fluctuates. No longer dependent on hardware snapshots for core backup functionality, but still able to take advantage of hardware capabilities when they are present.Most Hyper-V backup solutions today implement kernel level file system filters in order to gain efficiency. When you add a new virtual hard disk to a virtual machine that is being replicated – it is automatically added to the not-replicated set. This can be updated online. Dynamic memory is great, but more can be done. For Windows Server Technical Preview guests, you can now increase and decrease the memory assigned to virtual machines while they are running. You can name individual network adapters in the virtual machine settings – and see the same name inside the guest operating system. Able to manage Windows Server 2012, 2012 2 and Technical Preview from a single console. Network adapters can be added and removed from Generation 2 virtual machines while they are running. Updated hypervisor power management model to support new modes of power management. Over the years I have come across clusters in all sorts of states. Many with nodes that have a mixture of none standardised names or letter case. In my mind, a naming standard for nodes should be decided on in advance, one that will allow for additional nodes to be added to the cluster at a later date. The issue that I come across the most, is that of cluster node names that are a mixture of upper and lower case. 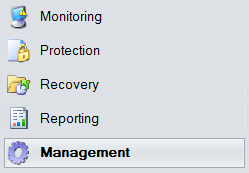 This in itself wont stop the cluster functioning but it is a personnel bugbear of mine. Nodes can be add to a cluster in a mixture of case due to a number of reasons such as the case of the NETBIOS name and its not something you can ever be sure of when using the GUI. One way you can be sure that the case will remain at what you specify, is to use the cluster.exe command to add the nodes to the cluster. The following shows one of the ways it can be used to import a new node into a cluster. This command can be used on a 2008, 2008 R2, 2012 and 2012 R2 clusters, however if planning to use cluster.exe on a 2012 or 2012 R2 cluster, you will first need to enable the Failover Cluster Command Interface feature. To do this open the Add Roles and Features Wizard then browse to Features\Remote Server Administration Tools\ Failover Clustering Tools\ and select the Failover Cluster Command Interface feature. Once the feature has been enabled, its possible to go ahead and use cluster.exe to add the node into the cluster in the necessary case. Once the command has run successfully and the node has been added and validated against the cluster, things will look nice and standardised.